Rookie wide receiver Ifeanyi Momah came to the right team to make up for lost time. 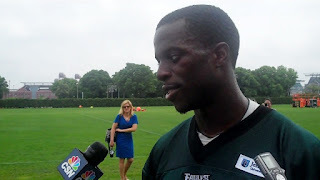 Momah after Eagles practice Monday. The 6-7, 239-pound Momah chose the Eagles, where player development director Harold Carmichael works. The 6-8 Carmichael made the Pro Bowl four times and amassed Hall of Fame-worthy receiving numbers in 13 seasons with the Eagles. "He's about a half-inch taller than me," Momah said. "The first day I got here I went in his office. He grabbed me, actually, and was telling me all the things in this league I could do with my height. And I'm trying to go out and use all that stuff and make sure that I use my height. Instead of just being out there playing football, go out there and be big. That's the main thing that we have to work on. It's in all aspects. Get in between the defender using your body. Beat him down the field. Use your body to get position. Even in short routes, trying to post the guy up kind of like a basketball aspect to it." Momah playing big at BC. For now, Boston College product Momah is living the dream after a serious ACL tear almost forced him into early retirement.